With music news dwindling down to just about nothing over the holidays, we thought we'd do something a little different for the end of the year. Instead of focusing on our favorite albums or shows of 2011, we thought we'd do a run down of the guests who visited us this year on our Washington Heights Free Radio broadcasts. 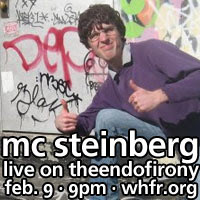 MC Steinberg was our first visitor. He had just come back from a trip to North Korea.